You should know that by default the keys for changing the convergence level are CRTL + F5 and CTL + F6, but they are not active so even when pressing them nothing will change. 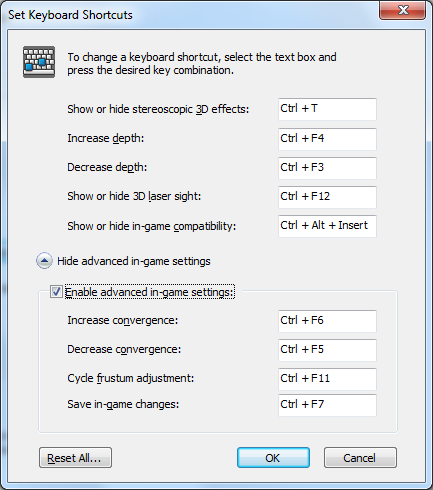 In order to be able to control the level of convergence you must first “Enable the advanced in-game settings” from Nvidia’s Control Panel by going in to “Stereoscopic 3D”, choosing “Set up stereoscopic 3D” and then opening the “Set Keyboard Shortcuts”. When you activate the advanced settings you would be able to use the CTRL + F7 key combination in order to save the custom settings you set by changing the level of convergence so that you will not have to make them each time you run a given game. However you should know that there is still no graphic representation showing you the level of convergence, so when you are changing it you must carefully watch the changes on the screen. Nvidia is probably going to build additional functionality into a later version of the driver that will show you visually the level of convergence such as the one already available for the level of depth.